Florida readies for direct impact by Hurricane Irma. 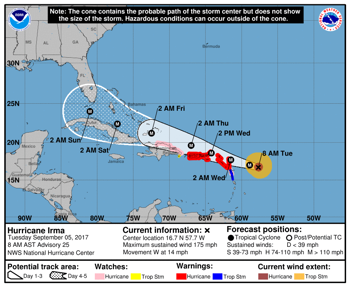 Florida is readying for a direct impact by Hurricane Irma as evacuations notices are expanded for the approaching Category 4 storm. 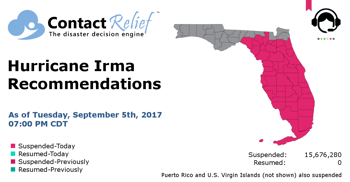 ContactRelief recommends suspending contact with consumers in additional Florida and Georgia counties as Hurricane Irma approaches. 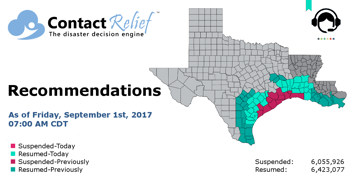 ContactRelief recommends resuming contact with consumers in certain Texas counties and Louisiana parishes except for the identified zip codes. 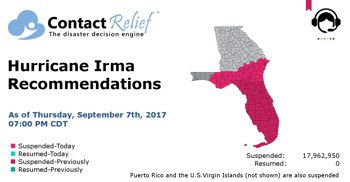 As category 5 Hurricane Irma invades the Carribean islands and threatens Florida, ContactRelief recommends contact centers suspend contact with most Florida consumers. Hurricane Irma, now a category 5 storm, threatens U.S. territories and may threaten Florida. 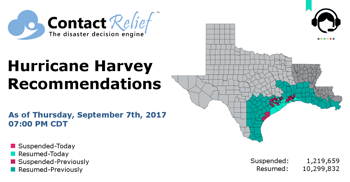 ContactRelief recommends resuming contact with consumers in certain Texas counties and Louisiana parishes. As we celebrate Labor Day, the effects of Hurricane Harvey continue to plague the Texas Gulf Coast. 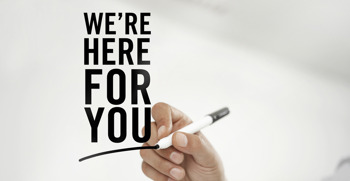 Protect your brand AND revenue when disaster strikes. Try ContactRelief FREE for 30 days. 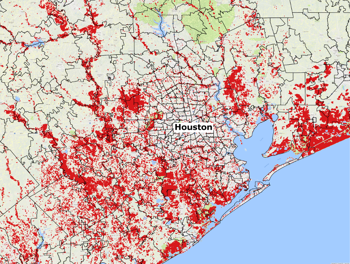 Discover how we can help you reach up to 5x more customers in a disaster zone – while protecting your brand image.